Reunion tickets cost £15 per person, including lunch. Bookings for the Alumni Reunion are now closed. For Alumni Reunion ticket enquiries, please email alumni@bcu.ac.uk or telephone 0121 331 5506. Alumni Concert tickets can be purchased on the day at the door. 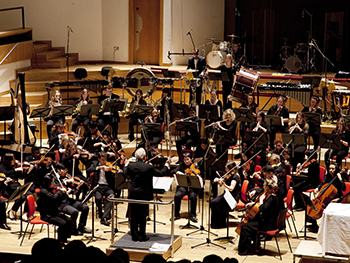 This June, we say a sad farewell to the Adrian Boult Hall, fondly known as “the ABH.” Since 1985 it has been of fundamental importance to Birmingham Conservatoire, the professional lives of all its students, visiting musicians and the City of Birmingham. Many of our alumni and former staff will have performed on that stage, sat in the auditorium and graced it to great applause when receiving their awards. The Adrian Boult Hall will finally close in summer 2016 and be demolished as part of the redevelopment of Paradise Circus. The Conservatoire will remain at Paradise Circus until 2017, when it will then move to its new, state-of-the-art purpose-built home in Birmingham’s Eastside. There will be a final Alumni and Former Staff Reunion in the current building on Sunday 5 June. This reunion will celebrate the life of the Adrian Boult Hall and its time at Paradise Circus. This may be the final opportunity for former students and staff to say farewell but will be the last time to perform on the stage. Alumni and former staff are invited to play or sing on that stage one last time on Sunday 5 June. Together with Alumnus James Ward OBE, we are arranging an alumni orchestral and choral concert on that day consisting of Parry, Faure and Shostakovich. The rehearsal will take place during the afternoon, and the concert (of about an hour) will take place straight after the reunion at 6.30pm. For this to work we need a full orchestra and chorus so please do take part. This concert will be ticketed separately from the main reunion and open to the public, with all proceeds from ticket sales going to student bursaries and scholarships through Birmingham Conservatoire Association. All former students and staff need to do is bring their instrument or voice and black tie/long black. Interested in playing or singing in the alumni concert? If you would like to play or sing in the concert, please email your details to us at alumni@bcu.ac.uk marking the subject of your email ALUMNI CONCERT. Guests are most welcome at both the reunion and concert, but they will need the relevant ticket. You can purchase tickets to attend the reunion or just the concert, or both. Players/singers in the alumni concert will not need a concert ticket. Tickets are non-refundable after 6 May 2016. All requests for refunds must be made in writing. All bookings must be made by 6 May 2016. Places are limited. Book early to avoid disappointment.